While these small towns might lack some of the big city luxuries, they more than make up for it with charm. Here is a list of some of our favorite European villages. Colmar is out of a dream. This medieval town in the Alsace region of France takes the #1 spot on our list. We are in love with this vibrant little village. It has so much personality and must be one of the most colorful and picturesque towns in Europe. TIP : Try and visit in December! Colmar has 5 Christmas markets during the holiday season. The entire town celebrates by decorating with lights and there is nothing more festive than walking around the old town with a glass of mulled wine in your hand. This little village nestled below the German alps is nicknamed the "living picture book." Every building is beautifully painted portraying stories of the olden days making it a real storybook village. Sitting on the edge of a pristine lake and underneath towering mountain peaks, Hallstatt is picture perfect. It's also one of the oldest towns in Europe. Lake Bled in the Julian Alps definitely makes our list. With a gorgeous church on an island, and a spectacular castle on the cliffs, it's no wonder Lake Bled is one of the most stunning lakes in the world. TIP: Right outside of Bled is the Vintgar Gorge. One of the most beautiful natural wonders we've ever seen. Pay the small fee to walk along the wooden pathways through the gorge along the clearest turquoise water you've ever seen. The Amalfi Coast of Italy is where dreams come true. The best of Italy; great wine, insane food, and a perfect seaside setting. TIP: Take the public bus to explore the other villages along the coast. On the way keep your eyes out for hidden beaches. Rothenburg is one of the most well preserved medieval cities in Europe as it never succumbed to destruction by wars or fire. TIP: Every night there is the "Night Watchman's" tour of the village. This spooky and hilarious tour shows you what it was like to live in Rothenburg during medieval times. The tour meets in the Town Square every night at 9:30. This unique tour should not be missed! Get lost exploring the cobblestone streets of Rovijn. Time moves slow in this beautiful seaside village. Along the wharf brightly colored buildings look as if they may crumble into the ocean. Rovijn is stunning, and should high on any travel list. TIP: Depending on what direction you are traveling, this could be your last stop for black truffles. Embrace this and eat up! This teeny-tiny village is hidden away in the Alsace region of France. Full of charm and fairly unknown to travelers, Egusheim is the perfect fairy tale village. You can walk around the whole place in 20 minutes. TIP: This little town is only a 15 minute cab ride from Colmar, making it an easy day trip. The Christmas market here is adorable as well. Cesky Krumlov is a very cool little town in southern Czech Republic. This old town has maze-like alleyways, and a castle sitting high on the hill above, Cesky Krumlov is bursting with history. It is not surprising that this little town is a UNESCO heritage site. TIP: In summer rent a raft and float down the river for a fun time and a different perspective of the town as you float on by. Bergen is a beautiful Norwegian harbor town. At the wharf you can buy fresh seafood directly out of the water. After a snack continue along the water to see the colorful wooden buildings of Bryggen. This scenic riverside town is unbelievably rad! Cochem has a cute town square, vibrant promenade and a neo-Gothic castle that sits above it all. The wine here is famous and you can see vineyards high up on the cliffs along this slow moving river. TIP: Take the short train ride to the stunning castle of Burg Eltz. It is one of the best preserved castles in all of Europe! It has remained in tact for over 700 years, avoiding destruction in both World Wars. One great part of Burg Eltz is the beautiful hike getting there from the train station, makes for a perfect afternoon! TIP: The Mosel River is a very slow moving river, next to the river is a bike path which offers great easy riding from town to town. We rented bikes and spent the day riding to Bernkastle-Kues. If you make it there be sure to check out this tipsy little wine shop. Menton is one of the most colorful beach towns in the French Riviera. The speckled buildings and different colored alleyways make it a picture perfect Mediterranean town. Not to mention their market is one of the best around! A quaint little canal town in Belgium that has it all! Beer, chocolates, and waffles! TIP: It's super easy to rent bikes in Bruges. For a fun day trip head outside the city walls to the tiny town of Damme. Along the way admire the historical windmills! The port town of Stari Grad on the island of Hvar is one of the oldest cities in Europe. 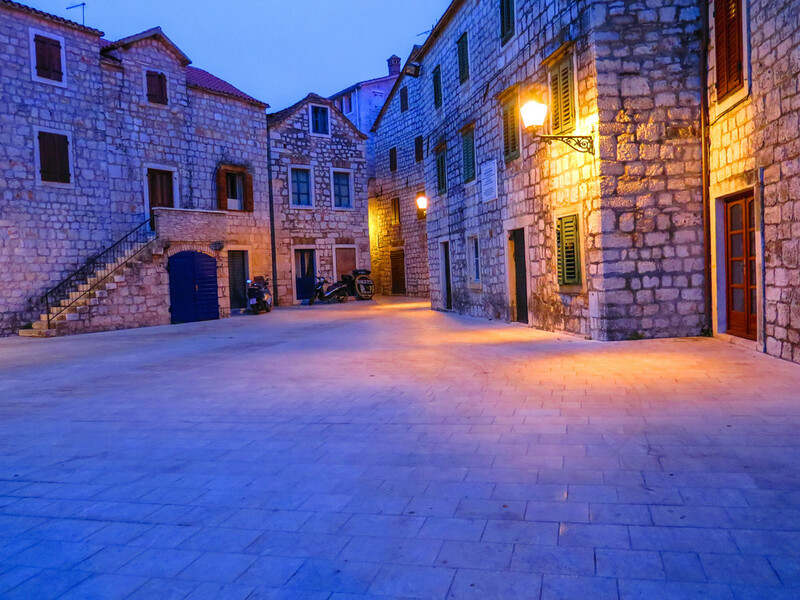 The beautifully crumbling walls and meandering alleyways make Stari Grad something straigt out of Greek mythology. TIP: Spend a warm summer night eating dinner at Antika restaurante. Request the rooftop terrace. The ambiance is gorgeous and it will be a night to remember. The closest town to King Ludwig's famous castles is the little town of Fussen. The castles are spectacular but inside the city walls hides one of Germany's cutest towns. This ancient town is set in the rolling countryside of England and has a magnificent cathedral in the center. The thermal baths were built in Roman times and have been around for ages! TIP: Only short drive from Bath is Stonehenge, one of the most mysterious places in the world. Definitely worth checking out. These five Italian villages are famous for how insanely beautiful they are. Hiking between these little towns should be on everyone's bucket list. This small mountain town in the Austrian alps is situated on a lake and is surrounding by mountain peaks. It is gorgeous and is where Mozart would come to enjoy some peace and quiet, and compose his music. It's only a 20 minute drive from Nice to this picturesque seaside village in the French Riviera. Catch the sunset and watch as the boats sail by. Bellagio is a dreamy Italian village situated on the shores of lovely Lake Como. Order up some pasta and sip on some wine and enjoy the slow life in this gorgeous lake side town. TIP: Looking for a fun activity while in Lake Como? Head over to Bellagio Water Sports and rent a stand up paddle board. We had a blast exploring Lake Como from the water. We hope you enjoyed our list and that you find yourself lost in one of these storybook villages! Sign up with your email address to receive news and updates from the road.